This cabin is located behind our office making it quiet and private. It has its own private parking area and has a small deck with a propane BBQ that is great to use during the summer! The living area has a dining table, double recliner, and a rocking chair, as well as an efficiency kitchen with a cooktop and small fridge, but no oven. 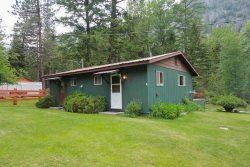 This cabin is in an ideal location that is close to the lake, the Wallowa Lake Lodge, the Wallowa Lake Tram, mini golf, and more! It is the perfect cabin for couples to reside in and explore one of the most beautiful places on earth! Book this cabin today and enjoy the Eagle Cap Wilderness!